The Starfish Pack Program at the Abbotsford Food Bank received a boost of funds just in time for Christmas! 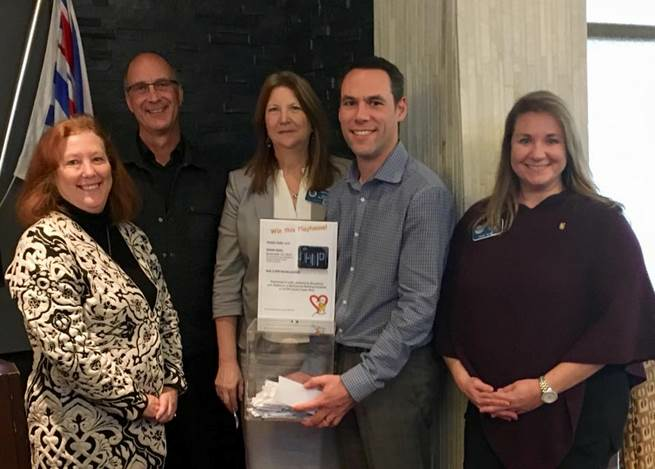 Rotary Club President Stacey Irwin was happy to announce that “the club’s Playhouse Raffle raised just over $5000.00 and the proceeds are being given to the Abbotsford Food Bank’s Starfish Pack Program”. On hand to draw the ticket was Vice-President, Chris Dominato of Woodtone Cedar Products. Woodtone donated materials and built the Playhouse. President Stacey Irwin expressed great appreciation for Woodtone’s generous donation and to Blackwood Building Centre for featuring the Playhouse at their store and rallying ticket sales to help make the raffle such a success and noting special thanks to our fellow Rotarians for selling tickets and to its organizers Bev Hasenpflug of Quantum Properties and Leslie McConnell of Myers Norris Penny Abbotsford.